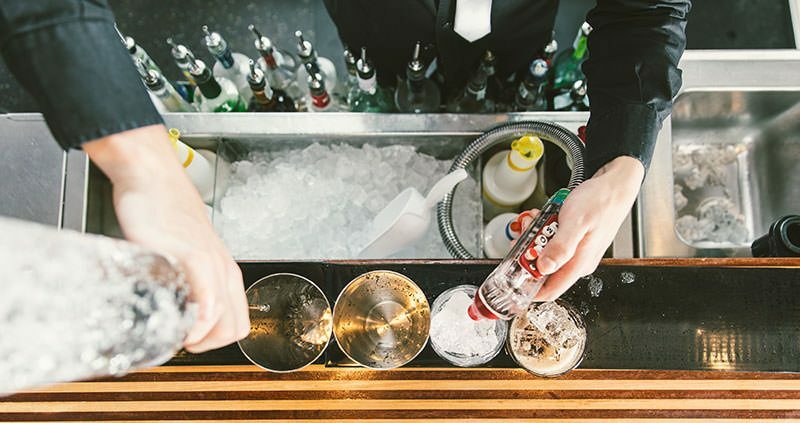 If you entertain and have parties at home, then you probably know that apart from having a fully stocked bar, a very important part of serving cold and delicious drinks and beverages to your guests is to have plenty of ice. While most of the refrigerators have the capability of producing ice, their output is not quite sufficient when your gathering is large. Also, juggling around the ice trays and handling the mess of melting store-bought ice can be quite a hassle. At such times, investing in a dedicated ice maker may be a very good idea. Ice makers are a great way in which you can make fresh ice available for your drinks conveniently. Ice makers also produce the right size of cubes for cocktails and beverages without the mess. Ice makers for homes usually are of two types, the under-counter types that can be placed next to larger appliances or your wine cooler and smaller countertop models, which are smaller in size and lightweight. 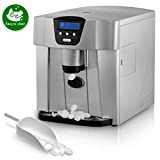 Under-counter ice makers are more expensive and require professional installation; however, their ice output is much larger, while countertop models are usually portable, they don’t need any special set-up, but their ice output is much lower. An important aspect to consider is how much ice you will require and this really determines the size of the ice maker you require. The ice maker should produce sufficient quantity of ice you need, say for a party or for home use. Ice makers can produce ice from 35 lbs to around 28 lbs in a day and they can produce excellent quality of ice very quickly. A portable ice maker has a very small storage capacity and you need to produce only the amount of ice you need. If you need to store a larger amount of ice, then you may require buying an ice maker that is larger in size and has a bigger storage capacity. Ice makers produce ice cubes of different sizes, while some newer models can produce 3 sizes (small, medium and large) as per your requirement. Buy an ice maker that produces ice cubes of sizes that you will need the most. A portable ice maker is quite easy to set up and use. All you need to do is pour in the water and plug the ice maker into the electric outlet and your ice cubes will be ready in a few minutes. Make sure that you buy an ice maker from a reputed and trusted brand. It is a good idea to read some online reviews and do your research on the features, performance, etc. of the ice maker before you buy one. In our buying guide, we have reviewed some of the best ice makers for your home bar and we hope that it will help you make a decision on the one that’s best for you. If you want to equip your home bar with an ice maker which makes ice quickly and in the large amounts you require, then the Della Portable Ice Maker is an ideal choice. 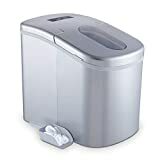 The ice maker is amazingly compact and the portability of the ice makes it suitable for you to make ice wherever you want, as long as you have a power outlet, be it on your kitchen counter, your RV, your boat or in your home bar. The Della Ice Maker is extremely easy to use. It does not require any set-up or installation and you can simply plug it into a power outlet, add water and wait for your ice cubes which will be ready in just 6 minutes flat. In a single day, the Della Ice Maker can produce as much as 26 lbs of ice. The ice maker is equipped with modern Compressor Refrigeration Technology that enables efficient ice production. The storage unit of the ice maker is insulated and can store around 1.5 lbs of ice at a time. The ice maker is equipped with a transparent window that allows you to see the ice being made and the ice maker’s control panel lets you regulate the ice making. The ice maker is equipped with an indicator light that lets you know when to add the water and alerts you when the ice bucket gets completely full. Sleek construction of the ice maker lets you store the unit convenient. Allows you to pick from 2 sizes of ice cubes. Removable ice trays allow easy transfer of ice. Makes ice in just 6 minutes. Produces 26 lbs of ice in a day. Can get overheated and ice can melt. Takes a few minutes to start up. There is no drain tube included in the unit to drain off the excess water. Produces ice slower than other ice maker models. If you want an attractive and stylish ice maker for your home bar, then the Della Ice Maker is an excellent buy. 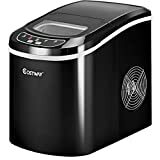 The durable construction ensures that the ice maker is long-lasting and the extremely easy to use interface makes using the appliance very easy. 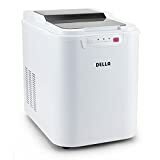 The capability of the ice maker to produce 26 pounds of ice in a day and its affordable pricing, makes the Della Ice Maker a value for money buy. Looking for an ice maker for your home bar? The Ice Maker from Magic Chef is a compact, yet high-performing appliance that is ideal for small spaces such as your kitchen countertop, boat, RV or bar. With an attractive stainless-steel finish, the Magic Chef is stylish and match your modern décor with panache. The Magic Chef can produce 27 lbs of ice in 24 hours and 2 different sizes of ice cubes, which makes the appliance an excellent accessory to have when you’re hosting parties, which requires plenty of ice. The machine can produce 9 ice cubes in just 7 minutes if you need ice cubes in a hurry. The appliance is equipped with a clear window, which lets you see the ice-making process and it has an exterior drain that allows the excess water to get drained off efficiently. The Magic Chef does not require installation. All you have to do is plug in the ice maker to a power source and enjoy fresh ice in just under 10 minutes. The appliance is lightweight and compact, which makes it easy to carry along and store. Produces ice very quickly in just 7 minutes. Produces around 27 lbs ice in a day. Offers a choice of 2 sizes of ice cubes. Exterior drain offers easy and efficient drainage. Drain plug may be a bit difficult to remove. You require to place the ice maker on the edge of the table or counter to empty the tank. The attractive design, fast ice production speed, efficiency and superior performance makes the Magic Chef an excellent product. The ice maker can produce ice continuously, which is a great plus. Overall, the Ice Maker from Magic Chef is loaded with several features that make it a good buy for your home bar. 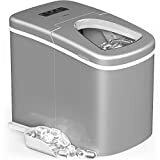 Whether you need plenty of ice for a special party or you need it on a regular basis for use in your home, the Edgestar Titanium Portable Ice Maker is an excellent machine to consider. The stylish ice maker has several features such as quick ice production and soft touch controls, all at a very affordable price. The Edgestar Titanium Ice Maker produces ice in just under 10 minutes and can produce around 28 lbs of ice in a day. The ice maker makes bullet-shaped ice cubes that have a hole in the center and it can generate ice cubes in 3 different sizes. And, if you don’t use up all the ice, the insulated container can store up to 2.5 lbs of ice. The compact size of the ice maker does not occupy a lot of counter space, which makes it convenient to keep on top of your kitchen or bar counter. The sleek size and the light weight of the ice maker make it very convenient to carry it wherever you want. The titanium finish of the ice maker adds to the stylish looks of the appliance, making it a great addition to your bar. Can produce 3 sizes of ice cubes. Soft touch control panel makes the operation of the ice maker very easy. Produces up to 20 lbs of ice in a day and can store up to 2.5 lbs of ice in the insulated container. Portable unit, easy to store. Does not require external drainage. Does not have a digital display. Does not have a self-cleaning option. 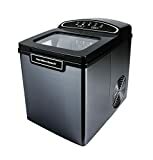 The Edgestar Ice Maker with its chic and stylish titanium finish is a great addition to any home. This well-constructed ice maker is suitable for personal use in your home or in any commercial establishment. The advanced ice-making technology produces ice cubes quickly in under 10 minutes and the compact size makes the ice maker very space efficient. The affordable price tag makes the Edgestar Ice Maker a nice budget buy. There are several reasons why buying an ice maker for your home could be beneficial. However, there are many brands, types and models out there and before you actually go out and buy one, it’s a good idea to evaluate the features and the pros and cons of each of the options available so that you get a good deal.